Whatever business you’re running, you can’t imagine it succeeding without having the right tools in use. Making the right choices about the tools and technologies you use is as important as the strategies and tactics you make. Going from building the first product features to our first users, while staying perfectly aligned as a team, we needed to find the right tools to work these things through. With thousands of tools out there, it’s easy to let choosing them get in the way of making some real progress. Instead, you should focus on finding the ones that will meet the needs of your business as you move it forward. In this article we share with you the list of tools that happened to be the right choice for us. So, take a look and you might find the ones that will work for you as well. Being a remote team, we give a lot of importance to the transparency of our everyday communication. Not raising our heads from email threads and spending hours on Skype conversations was a no-go. We needed something that will keep our communication effective, in one place, and in real time to stay aligned. This is why we settled with Slack. 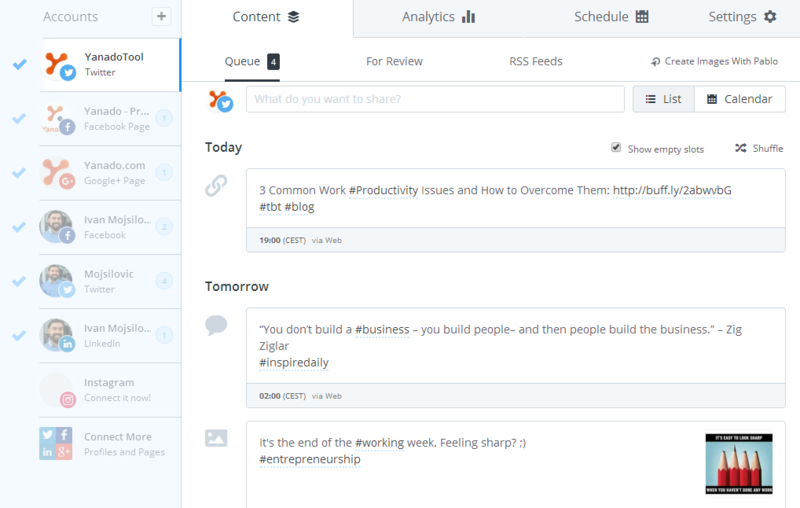 We love how it lets us segment our conversations in different channels for different topics. The search option in Slack is what we use big time. It’s great how it narrows down the search, thus increasing the chances of finding particular parts of the conversation that can easily get lost in thousands of messages written per week. The same goes with files and resources we quite often like to quickly pass to each other. There’s no chance any of these will get lost, as Slack keeps them in one place and let’s you search by name or keyword. 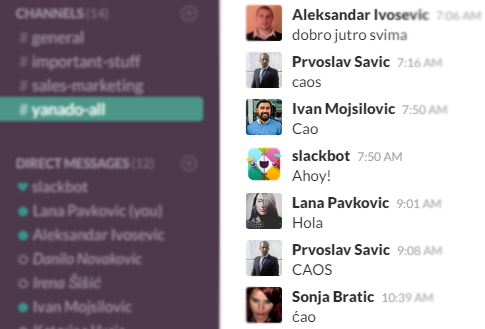 Each morning we start by saying hello to everyone in the group channel, making sure we know we have arrived at our workstations ready to rock the day. We leave it open during the day, jumping to it anytime we need to text each other. We use Slack to share ideas, ask questions, seek feedback, as well as to throw some aside jokes. We also have integrated it with Yanado – our very own task management tool, which lets us to quickly create and assign tasks right from Slack. It is a place from where we also derive small shots of motivation in different ways. For example, we have set up a personalized BOT that informs us in our group channel each time a user performs a payment. It is essentially a notification, but we also experience it as a small wind in the back that assures us that our everyday efforts get to pay off. When we don’t use Slack for team communication, we use Skype as it is still the best peer-to-peer tool out there for video calls and screen sharing. We also use it to communicate with our users and prospects, using our Skype US number. Often times when doing customer support, it’s better to get on a screen share to review the issue, rather than via phone or email. Living an email free life is still practically impossible, especially if you’re serious about running any kind of business. Being formally connected with your clients and partners requires spending most of your time inside your email client. In our case, Gmail has been an all time choice for email communication. Having Google family behind it is what gave us enough reason to entrust our business to it. Apart from the speed and a huge storage space, the possibility of instaling bunch of plugins to it is what really makes our lives easier. We use Google Drive in our daily workflow as a place for keeping all of our resources. It’s where we organize, search and collaborate around documents associated with pretty much everything we do. All of our ideas and resources live here. We keep important data organized in spreadsheets and drafts of our content organized in different folders. We always jump into Google Docs when we need to collaborate on new pieces of content for our blog. The great thing about it is we don’t have to worry about losing or updating any documents, and we can access them from any device. The biggest reason we like it is that it keeps everything in one place and is shareable with everyone on the team. There are different tools out there for tracking due dates and scheduling meetings, but we stick with Google Calendar. It’s simple and practical enough as it helps us to stay on track with individual calendars aggregated in one place. It’s integrated with both Gmail and our task management. It’s hard not to appear biased about this one. At the end of the day, this is not just a tool that pays our wages, but it is a tool we created to be able to organize and track our work with an ease while remaining agile and focused on getting the job done. It just happens to be our product, and the same value it brings to us is also being recognized by all of our customers. So, in our case, Yanado feels like home. We use it to manage all of our tasks, organized in different lists, visualized and tracked in one place accessible to everyone on the team. It does provide practically all of the features every project management tool out there has. However, what makes it different is that it works inside Gmail. We already are compelled to spend a lot of time inside Gmail to be able to execute our business. 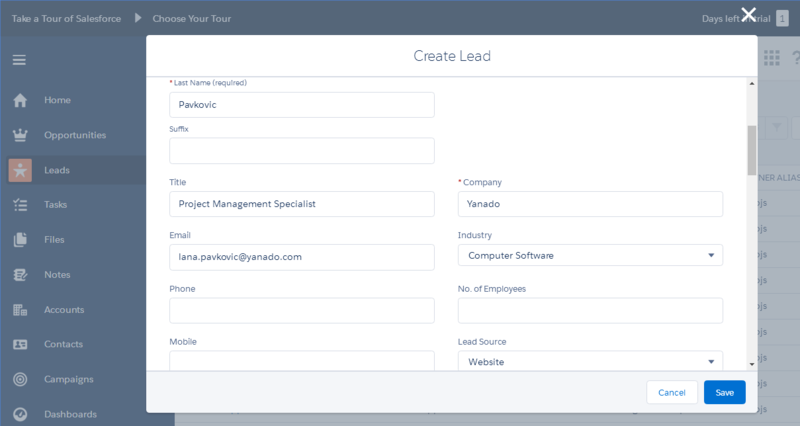 One of the features in Yanado that makes us feel about our email client as an actionable space is being able to turn emails into tasks with a single click. It makes our lives easier as it frees us from having to jump from email to project management tool and vice versa to be able to get the job done. With Yanado we’re able to use both of these tools in one place, that feels familiar and it’s easy to use. All in all, it saves us a lot of time and energy we already spend on juggling with different tools. 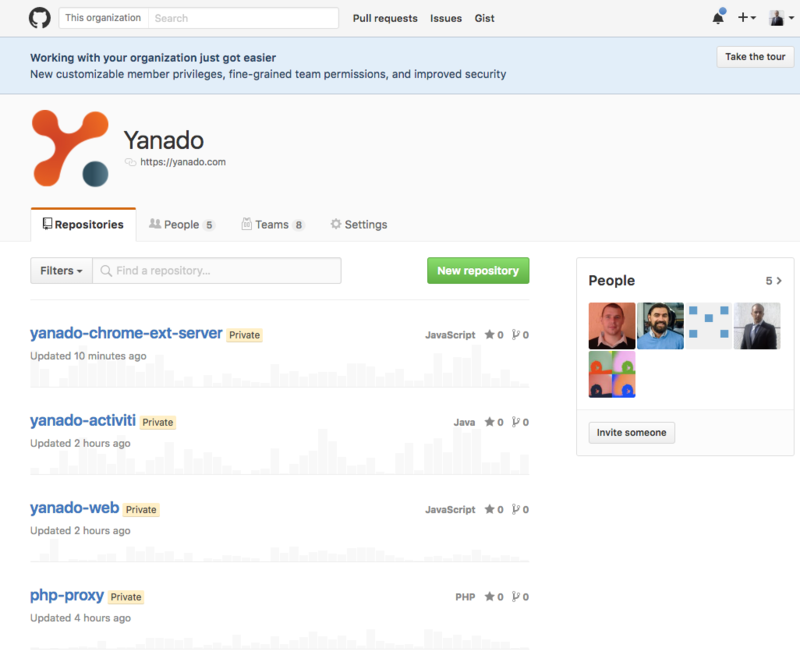 Our developers use Github to store the code securely and safely while working together on the same projects. Github has few features that we particularly like, for example the ability to set up webhooks and add services. Service list is wide and few items that we use are Slack and Jenkins. In our projects we use standard branching model, this model allows us to quickly respond to bugs and develop new features with ease. One of its features we rely on “big time” is team management with permissions. This helps us to set up who can write or preview the repository. We also take special care to preventing the undesirable errors by protecting main branches from deleting or doing any damage. We hope to add validators as well so that only high-quality code can be pushed. Choosing where to host your apps is always an interesting decision. Luckily for us, we have a long experience with Amazon (AWS), which allows us to be sure that our apps will be stable and scalable for the least amount of money. Two of the most interesting Amazon Web Services for us are EC2 and RDS. EC2 is the service most commonly used for elastic compute capacity, that allows us to have multiple instances that serve as production or staging environments. Most importantly we can scale our solution with few lines of code (or few clicks). Before RDS we had SQL server running on the separate instance, or on the same instance, depending on the application. Now with RDS we don’t have to worry about instances anymore. RDS hosts our database, in our case in MySQL. This helped us bootstrap our infrastructure fast and with minimal risk of failure. 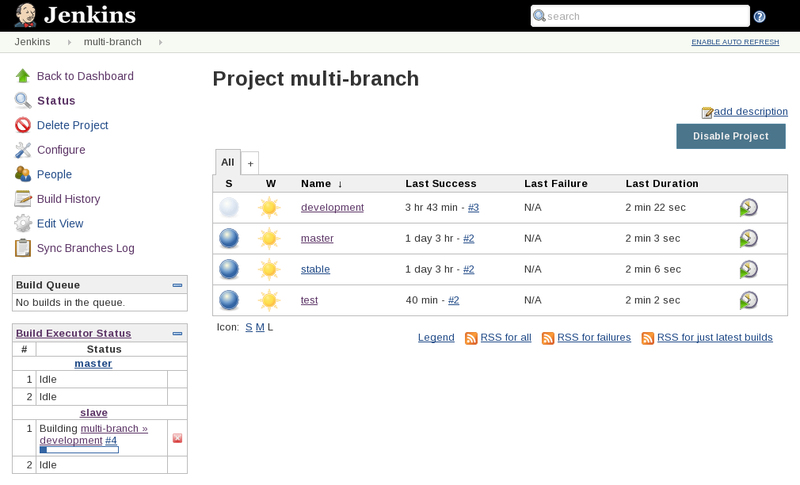 Another tool our developers use as a continuous integration server is Jenkins. It helps them to easily push the applications on different deployment environments (development, control and production). Github integration with Jenkins is especially important to us since we can setup Github to notify our continuous integration server that code is pushed. This information can be then interpreted in different ways by Jenkins. For example, every push to master results in deploying a related application. Apart from making it possible for us to deploy 4 applications (Extension, Web, Backend and Settings) with a single click, Jenkins is free and it gets the job done. With series of applications running on the server at the same time, it’s useful to have each of those applications run separately in their own containers. Docker makes this possible for us. This way each application’s configuration stays within its container, thus being completely independent of other applications and servers. So in case a server is down, or anything bad happens in this world, we can easily move our applications to another server, without having to change the application’s configuration. We use Docker, as it has no alternatives and it makes managing and deploying our applications much easier. Our blog is where we tell our stories. It is a special place for us, as it is where we put all our efforts into creating a valuable content aimed to bring more people to our website and to keep them coming back. Choosing WordPress for managing our blog wasn’t a hard decision, as it is the best tool for content management out there and it’s easy to use. When you start creating your content, you will have some ideas for the topics you would like to cover, but what you may not know if other people will find them interesting. Finding an exact topic that resonates with our audience is what we needed as a guide for our content creation, but we couldn’t just guess it. 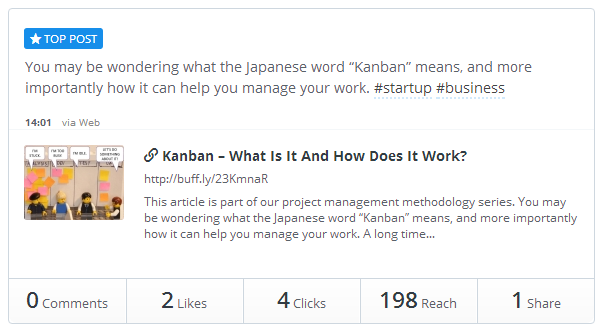 Buzzsumo is the tool of our choice that helps us pick more engaging topics with more accuracy. Knowing what generates the most engagement and which trends to follow is how we make informed decisions about what direction we should take in creating content. What’s great about it is that it lets us get insights into what type of content is already working in our industry. It does that based on the searching for a specific topic or keyword. It’s also easy to get an eye on competitors content performance as it lets you search for the most shared content based on the URL. There’s definitely value in being able to see things like who is visiting your website, where they are coming from, what pages are they visiting, how long do they spend on the site, and what actions (if any) users take on your site. Google Analytics allows us to track all of these insights for free. We use it to gain some data backed guidelines that help us to understand how we should drive our content marketing efforts. The success of a blog content largely depends on how many people actually get to read it. An important way to increase readership is to allow your blog posts to be shared easily and frequently on the most popular social networks. It’s what ultimately increases your traffic and your brand exposure. So, once you bring people to your blog, you should also make it easy for them to share your content. This is the reason we use the Social Warfare plugin which makes it possible for us to include social share buttons on our blog posts. Some would say looks aren’t everything, but Social Warfare really refutes this with their social share buttons. We don’t wanna sound subjective here, but after all the seamless searching, we found these icons to be really the most stunning ones out there. Plus, they work smoothly and do not cause our blog to slow down. As non-native english speakers, it’s not easy for us to feel confident about what we’re writing, and if our everyday work is error-free and easy to read. Autocorrect does this job well, but Grammarly goes beyond. It’s a tool that works more thoroughly than a typical spell checker, scanning for more than 150 common and advanced grammar rules. It works as an online grammar editor that we often use when creating drafts of our content. Most of the time we use it as an extension in the web browser and it works with us in different places – whether we’re writing emails, or interacting on the web. It doesn’t just point out to the spelling mistakes, but it also gives a detailed explanation of the reasons behind the mistake, together with suggestions on how to improve it. We enjoy it because it works fairly well, improves our knowledge of grammar, and it has a really beautiful and smooth user interface. To be able to get the most out of your social media activity, you have to figure out what makes the most sense for your audience. This is how you hit them with the right content at the right time, and at a constant pace to ultimately bring results. To not have to do that by hand, we chose Buffer as a tool that enables us to schedule social media posts on our social media networks (Twitter, Facebook, Linkedin and Google+). The great thing about it is that it allows us to automate our posts based on the chosen time of the day and it helps us to also measure our social media performance. With Buffer, we are able to easily set up the best time and day for posting on social media, according to the time zones we would like to cover (Europe and America). For example, we post our stuff during the working days, as we are mostly focused on business people. When deciding about the frequency of posting and sharing our content, we think about where our target audience usually is. So we stick with posting 3 times a day on Twitter, 2 times a day on Linkedin and Google+ and once per day on Facebook. The great thing about Buffer is how it keeps track of what’s happening with our posts. It lets us see how many of the posts have been viewed, opened, liked or shared. This is the priceless data based on which we try to adapt both the frequency of posting and the content itself. For example, what time is better for easy and entertaining content (like some productivity related quotes and memes) and what time is the best for insightful and resourceful links from our blog. Like with any other social network, the magic of Twitter works pretty much like the ripple effect. A piece of your content gets shared with your followers, their followers share it again and so on. To have that, it’s important to find an easy way to encourage your followers to tweet your posts and make it as simple as possible for them to do so. We do this with a Click To Tweet tool that enables us to make a pre-filled Tweet status. Essentially it is a tool that creates links that generate “ready to go” tweets. We like to include these links in emails we send to our subscribers and users informing them about the latest stuff in our blog that they can share. Apart from having a great product and equally great support, it’s also important to keep your users engaged with your company in order to deliver a constant value. Every first week of the month we make sure we send our users a newsletter to inform them about the new resources they can find on our blog. We do that with Sendgrid, as it is a tool that makes it super easy to create and send thousands of emails at once. We also use it for sending information about product updates and for transactional emails. It is better than the tool we used before, because with Sendgrid we can organize recipients into different lists. This way it’s easier to do the recipient segmentation, thus making sure we’re delivering content relevant to the people reading it. As our user base started growing, so did our sales. We needed a place to keep track of all the data associated with our prospects to have a clear understanding of our general progress in sales. At the beginning, we did that by hand dealing with fuzzy spreadsheets, which made it hard for us to extract any tangible data or reports. The reason we chose Salesforce is that it comes as a comprehensive solution with all the features needed in order to see how we’re standing in our sales performance. Turns out that, when running sales every single detail means something. Don’t you want to know how and how many times has someone read your email? What about time? Wouldn’t you like to know what’s the most convenient time to contact someone? When they’re usually free to fully commit their attention to your email? Yesware made it possible for our sales team to have these details in real time. It comes with a good price and it works fairly well. Yesware not only allows tracking of which of the emails we send to prospects have been opened, but also their geolocation, which devices are used most, how many times our sent emails have been opened, and whopping amounts of other priceless info. To be able to help our users to get the most from our tool, we had to identify them, and then try to understand how they interact with it, by measuring the level of their activity. This tells us who is an active user and who is not, what features are mostly being used, and why certain users don’t use some of the features the way we expected them to. This is how we are able to keep track of those things about our product that make the most sense as well as the ones that don’t. Having these insights is the only way we can ensure customer success. Having the right tool to handle this was a very important choice – and Intercom happened to be the one. It all starts when a user registers to our tool. We use Intercom for our onboarding campaign. 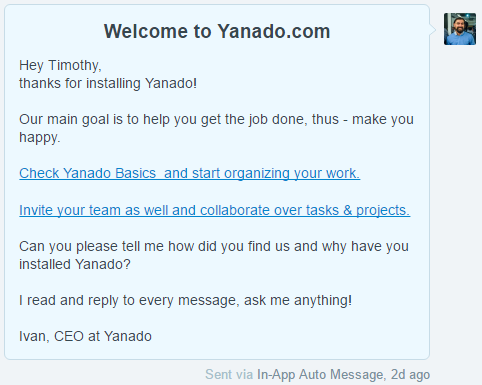 We do that by creating 6 to 7 emails we send through Intercom to our users based on their activity from the moment they sign up to Yanado. Another great feature in Intercom is the chat feature we use for customer support. It’s super easy and effective, as it makes it possible for us to communicate with our users in real time when they seek help. Having all of our users tracked in one place is how we understand what they have been doing, how many other users they have in the team and what activities they have performed inside our tool. All in all, having a clear picture of our user’s “health” is how we manage to help them when they need us. So, these were the tools we settled with to be able to run our business. 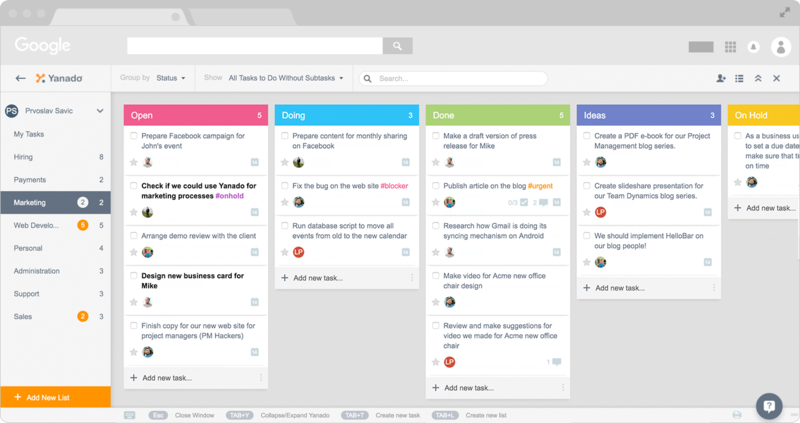 Hope we gave you some ideas for the tools you can use whether for team collaboration, content marketing, sales or development. Tell us about the tools you found to be the right choice for your business? Would be awesome if you could share those with us in the comments bellow!